STAR. Fleet owners and managers locate, monitor and communicate with all their vessels with a single heads-up display featuring common interface ele- ments. To generate tracking information the ship owner or administrator simply sets the desired time interval for reports. Excel for trending and analysis; intuitive interface requires little or no training. System (MPDS). The Nera F77 package includes high-speed ISDN at a 64 kbps. which permits fast data transfer. This gives a ship online access to a whole range of applications like the internet and e-mail. II-WS Iridium System features a ruggedized design designed for mar- itime use and environment. It is vibra- tion resistant and features low power consumption (25 W in TX mode / 8 W in stand- by mode). Network (Regional BGAN) offers reli- able. 24-hour a day Internet Protocol (IP) connectivity at data speeds of up to 144kbps via a secure channel. The serv- ice is available in Europe, Asia, and northern and central Africa. Services. This exclusive communica- tions feature affords Marlink customers access to a secure transmission path for their high-speed data communications. BGAN is its cost effectiveness. Connection to the Internet or a private network can be kept "always on" as cus- tomers pay only for the amount of data sent or received. Regional BGAN offers the additional benefit of using notebook- sized, portable satellite IP modems. IS IN THE PALM OF YODR HAND. 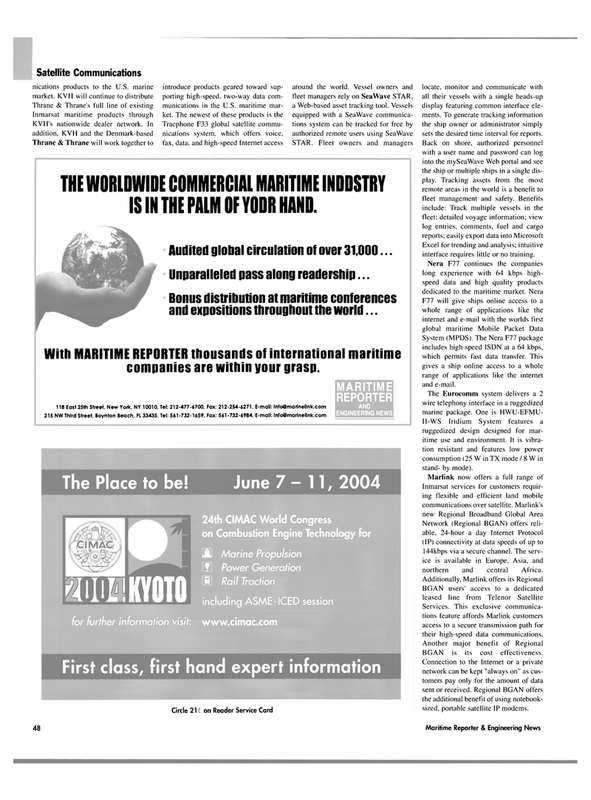 With MARITIME REPORTER thousands of international maritime companies are within your grasp.